It was a wonderful day right before the start at 7:30 am in the morning light at Petra Tou Romiou. 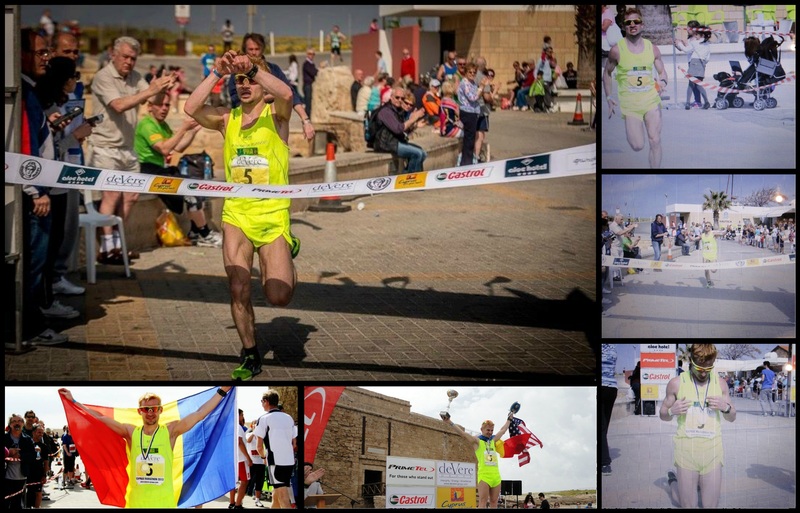 Everybody was full of joy and ready for take off with a partly cloudy sky at about 17° C. It couldn't be any more perfect for us runners on the sunshine island of Cyprus. 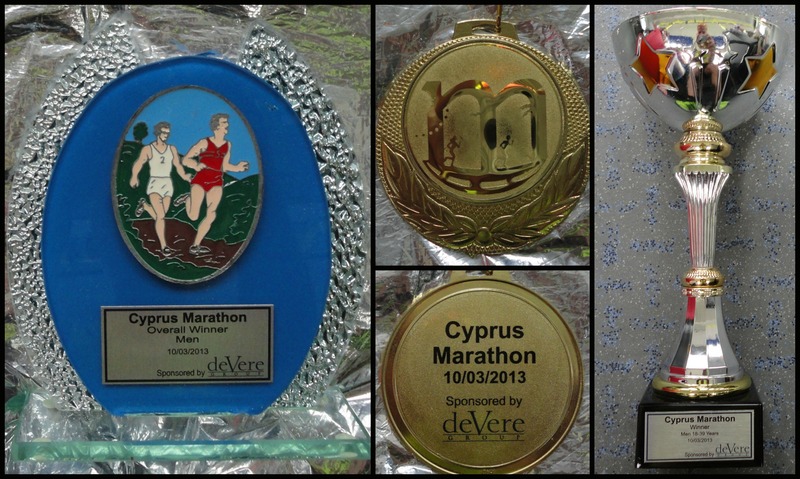 I was absolutely motivated to finally win my first Marathon. Last year's winner Slim Samer did not start due to an injury so it was just Marek Omszanski, Tim Artus, Knudsen Ed and myself who had a real chance of winning this race. Usually I am very excited, but this time I was quite relaxed and very confident. Marek just dashed away right from the start with Ed closely following his footsteps while I was watching them from 3rd place. After the 2nd kilometer we had formed a 3-man leading pack and started chatting like crazy, having lots of fun, as my Mp3 player's battery ran empty. Marek's record by then had been 2:50 h while Ed was debuting on that day with his aim to go sub 3 hours. 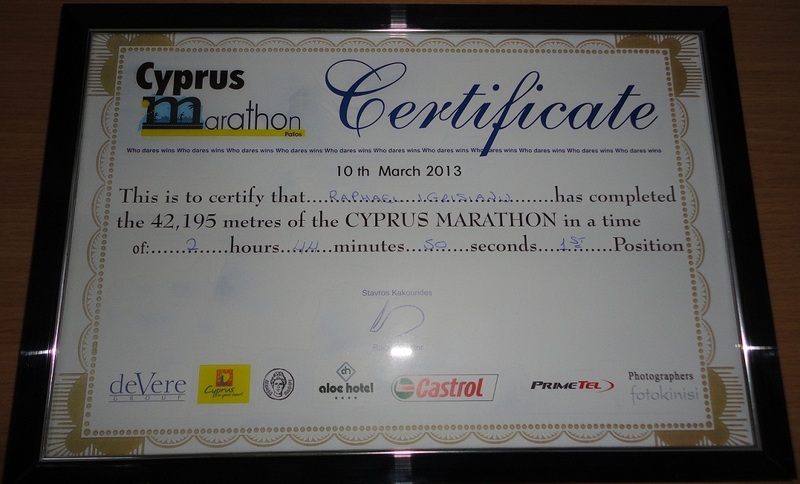 We were constantly keeping a 2:49 h pace all the way to the Paphos International Airport, our first turning point. We crossed the half-way point in 1:24:06 h at a time we didn't know yet that the second half would be a bit flatter and easier to run. Now ona a 2:48 h course from 22 - 26 k I realized Marek had started having slight difficulties in keeping our pace. During kilometer 27 we lost Marek. At 28 k Ed told me he was hurting and from that point on I knew I would win it. He could no longer keep my pace as I had already started to accellerate towards a 2:47 h finishing time. The race had just begun while I started to feel stronger every single kilometer that was passing by. It was absolutely enjoyable chasing that pace car well knowing that pictures were being taken of me. After the second turning point I felt really great as you can see in the picture below. As I still proceeded my race cautiously by 35 k me and my escorts now approached the center of Paphos where the unclosed traffic got more heavy with an unpleasant polluted air. But this was exactly what I needed to go wild and to shift a gear up while I was almost brushing the cars that I was now fighting with to maintain my racing line on the roads. At kilometer 37 I noticed I could run a personal best as I raced a 2:46 h pace. At kilometer 39 I became aware this was my first Marathon ever without having hit the wall so I kept pushing forward staring at a 2:45 h pace on my Nike watch. At 40k I shifted into my highest gear grasping the unique opportunity of qualifying for the New York Marathon by going sub 2:45 h.
At 41 k we entered the pedestrian area right along the coast where the traffic was so dense that the leading vehicle and the police car had to slow it down a bit. I felt I could make a big move and overtake the leading vehicle in the right moment and I succeeded in doing so, a moment that got captured by the camera. I also managed to outrun the police car that had been pacing the leading vehicle throughout the entire race. Now with about 250 meters to go I set off like a gun side by side with the police motorbike and sprinted like a maniac as my clock had already shown me a 2:44. 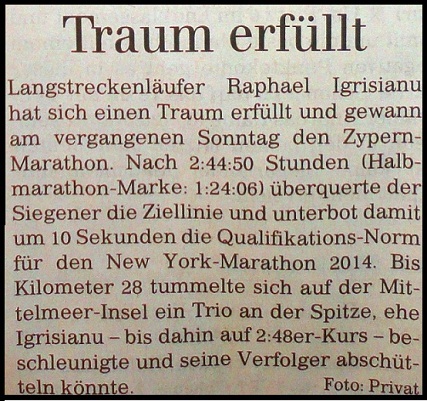 I reached the finishing line only 10 seconds under the qualification time for the New York Marathon 2014. As always, I dropped to the ground, kissed it, made a cross and thanked God for this honorable succes. 2:36:35 h as well as my fastest finish ever in 8:11 minutes (2:37 h pace). My fastest Kilometer was the 42nd in 3:34 minutes while the slowest was at the 5k mark in 4:08 minutes. The race took a surprising turn though as Tim Artus had managed to finish in 2nd place with a 2:50:25 h overtaking Ed as well as Marek. Ed had finished in 3rd place and debuted with a strong time of 2:51:28 h while Marek had struggled to stay under 3 hours in 2:58:42 h.
According to the words of the race director's son I "dominated the race" in a winning margin of 5:35 minutes.